So what happened with the wargaming weekend last week? Well, Kevin came up Friday afternoon and we sat in the sun chewing the cud, drinking the beer for the evening. On the Saturday, we went to the local beer warehouse (see the trend here?) where we got some really good bargains (£20 for 20 bottles – various breweries). Then back home and sort out the pond – liners in – hose on – beers popped and settle down to watch it fill. See earlier posts re pond!! 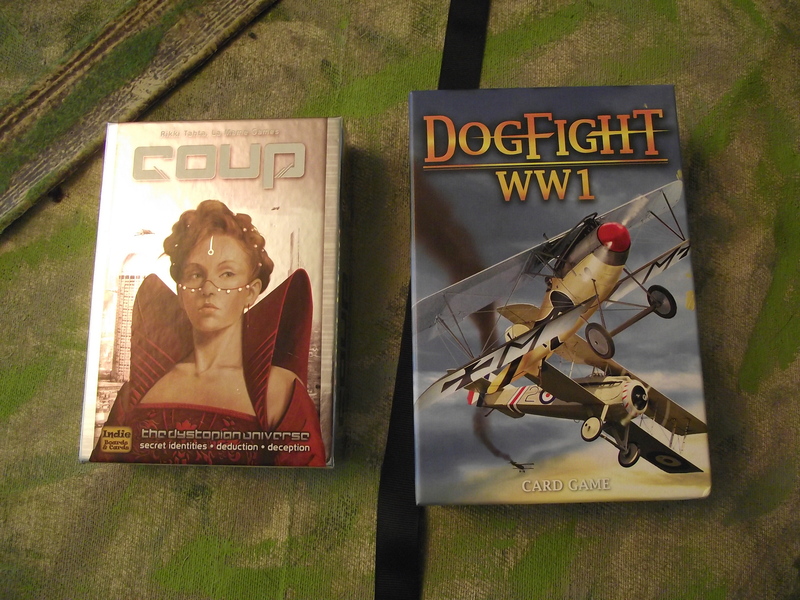 Saturday night we played Coup . Dogfight WW1 was a game that had so many expectations but actually just turned out to be Top Trumps. Wasted opportunity of glorious graphics. Sunday, out early to buy plants for the pond – then more sitting in the sun chilling. 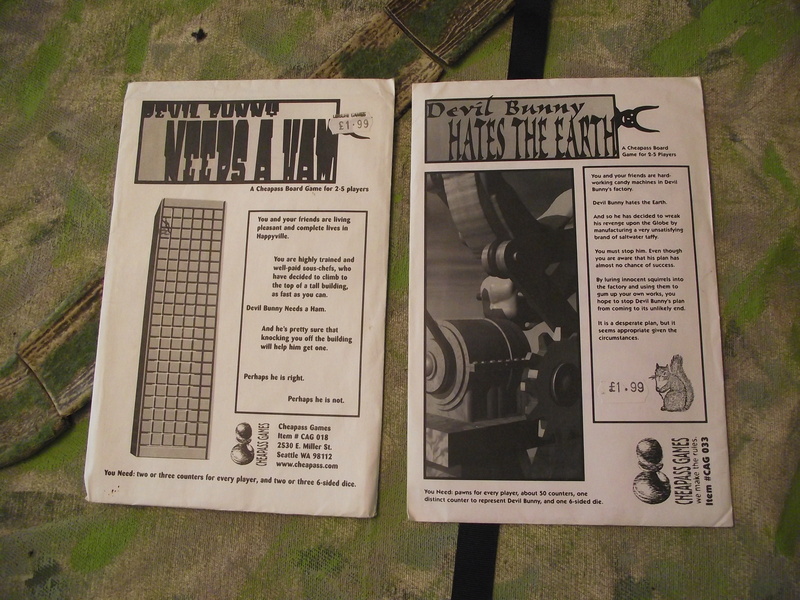 Sunday night we didn’t play anything – we hoped to play Devil bunny needs a ham, as we are both Cheapass Games fans. These are original old style Cheapass games. I think we played a horse racing game bought up by Kevin – great fun but can’t remember the name. Monday, public holiday we finally got the toys out!! We decided to play through the Battlegroup Tobruk rules. We started with a small scenario – two recon/long-range desert groups fighting over an oasis. Kevin took the Brits (far end), I had the Italians (this end). 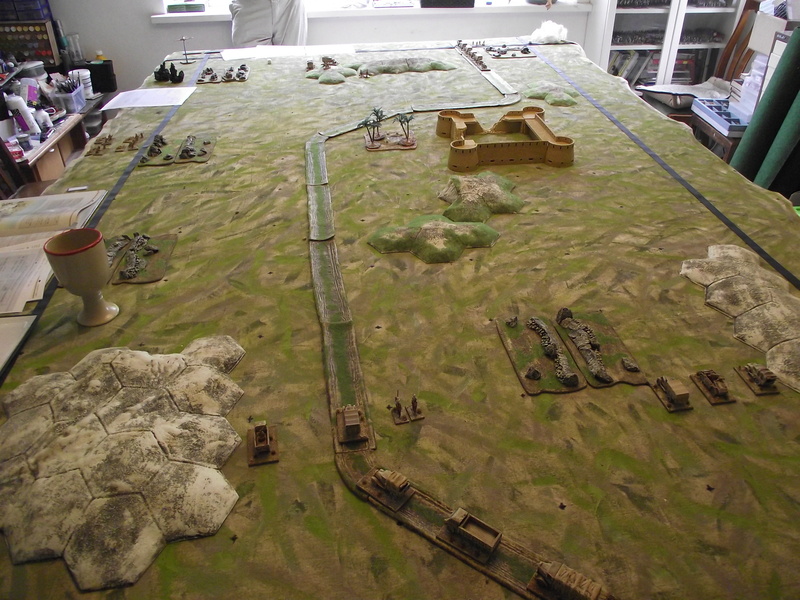 I came roaring on up the road whilst sending a right hook round to capture the ruined fort, Kevin just sat with a 47mm portee and took me out – whilst sending a demo party in to blow the oasis and win the game. Grr. It was over quickly, and fairly brutally – in rereading the rules we worked out the damage to troops in a hit truck wrong – however it would have made no difference to the end result of the game. We were using Alpaca fibre as dust clouds for moving vehicles – it’s a modifier in the observation and hitting rules so it served a purpose to show those vehicles moving. 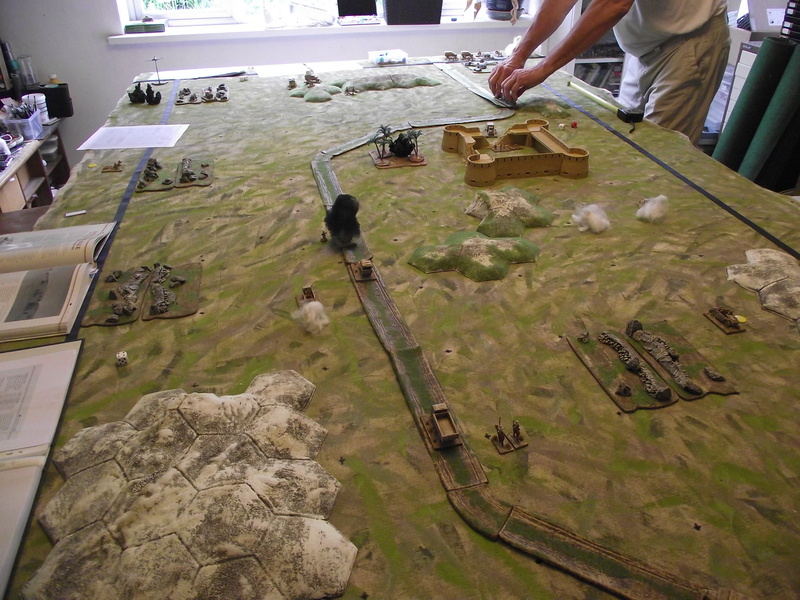 We moved on to the second game – a larger battlegroup fight featuring tanks, guns, aircraft and artillery. Kevin took the Brits, I the hapless German DAK. Same terrain, same sides. I set up a A/T gun line with 2 50mm, a 37mm doorknocker, a 75mm infantry gun and a PzJg 1 on the left, whilst putting my tanks (3 x PZ 11C and 3 x Pz 111G) to push through on the right. My lorried infantry was in the middle to assault the ruined fort. Kevin put his tanks( 3 x A13 and 3 x Honeys) and his two carrier sections on my left, whilst his lorried infantry and a Matilda 2 on my right. From the off he attacked my gun line, whilst I called up a Stuka attack against his tanks – killing one and pinning his carriers – whilst on my right his Matilda proved why it was called the Queen of the desert – blunting my tank thrust – grrrr. With increasing casualties on both sides – the gun line held against his tanks – his Matilda proved to good for my tanks and the infantry of both sides were close assaulting each other in the ruined fort we felt we had tested all the mechanisms in the rules – and enjoyed the game. The Boy decides the game is over!! Looking back at the rules a few days later I realise that we hadn’t quite got all the artillery rules right – however most of it we did. I was really frustrated with the less than helpful QRS – and the lack of an index in the rules coupled with the propensity of the rules to reference other bits of the rules without giving a page number – Kevin said later he was judging the quality of the rule layout by the increasing numbers of curses coming from me trying to find an answer to a question in the rules. I like them – I will be designing my own QRS!! The Battlegroup Tobruk supplement is very good – and the army lists force builder mechanism a joy. Everybody hated this nuclear war risk type game – I won of course and they all burned!!!! A note in the box made me realise I hadn’t played this game for over 30 years. Kevin helped with Alpaca shearing on the Tuesday before leaving to rejoin the human race. He left me with two wonderful gifts. 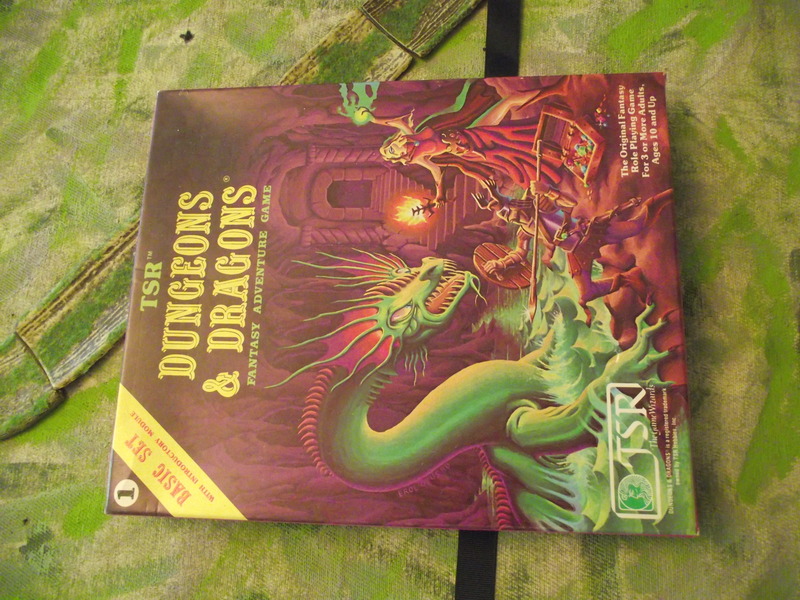 As a part of my Old School AD&D project he gave me this original (1981) mint condition D&D starter set – a starter book and the B2 scenario – Keep on the Borderlands. I did have a scenario I was going to use – but I am now going to use this one. In the box was a sealed bag with a crayon and dice set, all unused. 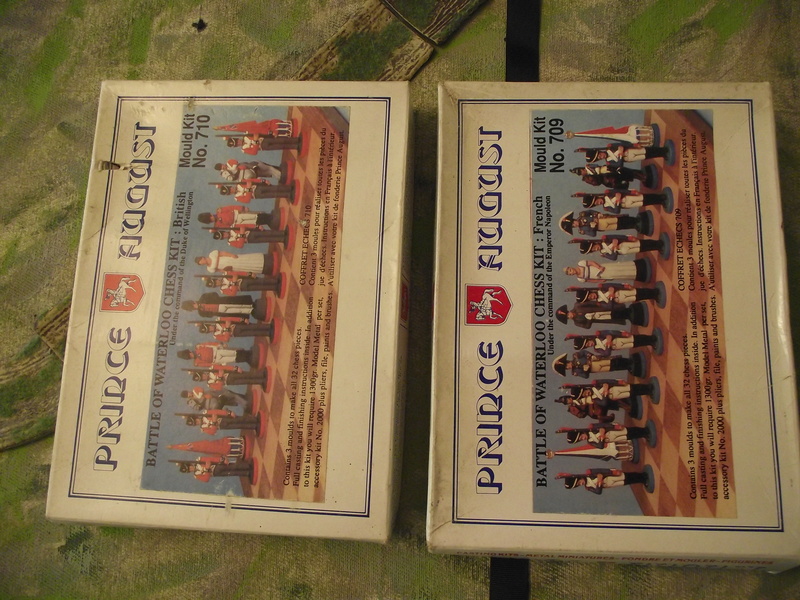 A Prince August Waterloo Chess Set – unused and in original packing – I’m in two minds whether to use it or just admire it’s mintness! !